Nuclear disarmament, like the environmental movement of old, is often seen as an elite issue – only open for discussion by policy wonks and military experts. The reality, though, is the nuclear program in the United States directly affects marginalized populations and should be a part of justice movements we see today. Native Americans and working class people still suffer the effects of nuclear testing, improper storage, and the hazards that come with the continued mining of nuclear material. As Trump calls for an expansion of the nuclear arsenal, these problems will only be magnified. 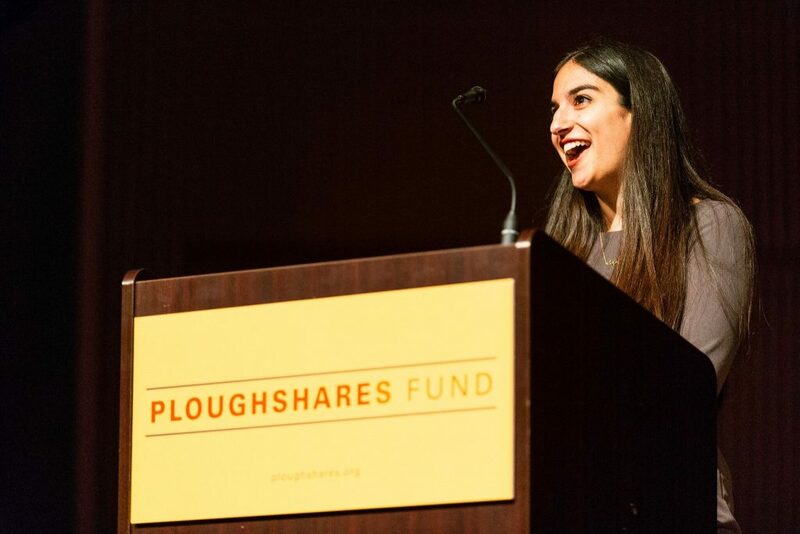 On June 25th, 2018 at the Ploughshares Chain Reaction: Leadership and Democracy event I presented about the intersections of the nuclear disarmament movement with other movements across the United States, and called for solidarity between nuclear activists and those fighting for all aspects of justice. It has been edited for clarity. I am excited to share my work with all of you here tonight. Everyday with Beyond the Bomb, my job is to take the reality of nuclear weapons, distill it, and then communicate it in a way that inspires a generation to take action to eliminate nuclear weapons. My goal is to take a system developed in the back rooms of government, formerly reserved for men in suits with power and influence, democratize that system and ultimately eliminate it. We are all in this room because we believe not only that this is possible, but imperative. While our paths to this conclusion may differ, we are united by a shared, fundamental belief in peace and justice. I’m probably not the type that comes to mind when talking about nuclear disarmament. First, I am young. My generation did not grow up in the shadow of nuclear war. Second, I am a woman. We are still largely shut out of many important discussions on national policy. And, frankly, under this administration are seeing our rights come under threat. Third, I am the daughter of an immigrant. The issues that tangibly affect immigrant communities on a daily basis often take precedence over an abstract idea such as nuclear war. My identity has put me on many fronts of the battle for the soul of our country that rages on as I speak to you tonight. So, how can someone like me, a member of many groups the system is meant to disenfranchise, fight back? Feminists continue to fight against gender based violence and inequality. If recent elections and popular protests are any indication, my generation is beginning to understand the power of collective action as a tool for challenging entrenched powers like the NRA or the presidency itself. People of all backgrounds are fighting to make sure that the US is an open and safe place for all who wish to join in weaving the fabric of our nation, and that the color of your skin does not dictate where you are accepted or what you can do. All of these struggles speak to me personally. So why have I dedicated myself to the daunting task of eliminating nuclear weapons? Like my identity, the existence of our nuclear system touches on these fights as well. Nuclear weapons are talked about in gendered ways. Military discussions of nuclear weapons often become measures of manhood. Countries who possess them are seen as masculine and potential targets as feminine, thus extending the paradigm of gender based violence. The nuclear system itself is designed to be undemocratic and act unilaterally on behalf of those deemed ill-equipped to make such decisions–something that I am used to hearing as a young person involved in politics. Arguments for the use and need of nuclear weapons center around the dehumanization of foreigners and the trivialization of their suffering. A rhetoric we’re familiar with from its use in issues like immigration. It is crucial to recognize that we cannot effectively dismantle our nuclear system without also addressing its intersections with the societal structures that led to its creation. Our movement does not, if you will pardon the pun, exist in a silo. Nuclear weapons are just one manifestation, albeit a very frightening one, of a larger, pernicious system of oppression, and this system must be challenged wherever we see its effects. With so much at stake, Beyond the Bomb is fighting locally to effect change nationally, and we’re exploring ways to work with other movements and empower our volunteers to do the same. When we fight to rid the world of nuclear weapons we cannot lose sight of the broader struggle to which our movement belongs because, ultimately, we are all working towards the same goal: A world that is safe, livable, and just for everyone. Over the past year Beyond the Bomb has been working to inspire people to take action. Here in San Francisco, activists passed a local resolution calling for checks and balances on the president’s sole authority to launch nuclear weapons – adding to 11 other cities we’ve organized to do the same and 8 states including CA that have introduced such a bill. So what are we doing next? As teenagers promised during the March for Our Lives and the Women’s March declared this year: We are going to the polls. Congress has the ability to institute a No First Use Policy. It is up to us to hold them accountable. Beyond the Bomb will be working to provide voters with the information they need to make an informed decision so we can elect candidates who will rein in nuclear authority and make sure the country never begins a nuclear war no matter who sits in the Oval Office. The more visible we can make the nuclear system, the clearer the line we can draw in the sand, the easier it will be to hold those in power accountable. Together, we can work to ensure that the day will come when nuclear weapons exist only in history books. Nuclear Myths: What About Jobs?